Immigration Information New York City: Why Is It Such a Hot Button Issue? In every election, the subject of immigration comes up. During the most recent one, immigration policy reforms were brought to the table again and again and cited as the reason that our economy was weaker or why there weren’t enough jobs for citizens. With the current immigration issues on the table in Congress such as the desire to build a wall to keep out Mexicans or getting rid of DACA, it’s a topic that ignites fury in some and in others empathy. Whatever your feelings might be about immigration, it’s important to explore the question to figure out why it bothers some people while others want to help. In today’s immigration information blog, we’ll be exploring this hot-button issue to figure out why it’s constantly brought up in elections, it’s often up for reform, and there’s a notion that immigrants are here to weaken the economy, which is used again and again to defend removing families from America. Keep in mind as we step into this hotbed of differing beliefs that the United States Of America was founded on immigrants and the above quote on the Statue Of Liberty shows that initially, we welcomed people to this country. 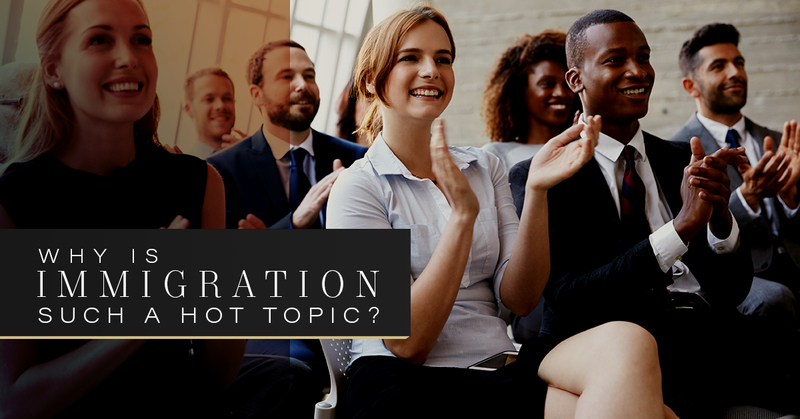 Additionally, today’s blog topic is to help you explore more information about immigration and why the topic is brought up time and time again in the news. Immigrants have been coming to this country since the 1600s before we were a country, but it wasn’t until the late 1900s that immigration became a serious issue and xenophobia became more prominent. With the arrival of the Irish, Italians, followed by the Chinese, and finally Hispanics, immigrants have continued coming to this country despite the hate and rhetoric that’s followed them since arrival. As legislators change and make decisions about immigration reform, the discussion of immigration is ruled by two sides. There’s the first one about how America is supposed to be a chance to achieve everything you’ve ever wanted. People come to this country to achieve the American dream and get the freedom that’s been long ago denied to them. They are here to create a better life or to have more opportunities in their field. They are here to give the best life to their children or to escape from war-torn countries. Then there’s the second one that points out that immigrants deprive the citizens of the country of their resources such as in the job market. Time and time again you’ll hear the argument that “An immigrant stole my job” or “I could have gotten the job if they didn’t have to fill their affirmative action quota.” There’s also the idea that immigrants are making the country weaker, that they don’t belong here, or that they should become more Americanized. This topic is drawn from xenophobia. Another more recent idea behind immigration is that people coming into the U.S. are associated with ISIS and are infiltrating the country with terrorism. So, why is it such a hot topic? If we’re founded on people coming to this country to have a better life, what changed to make people not want others from differing countries? While there are many ideas behind this simple question, we’ll never truly know why. We’ll meet people with differing opinions and ways to fix the problem, but for now, we’ll have to rely on theories. For more immigration information, stay tuned for our next blog.